#Dax #SP500 We remain confused at the debate as to whether the UK should exit the Eurovision Song Contest. Political manoeuvres making the stock market difficult to read, a media similarly confused as to their stance, and a distinct problem with the FTSE at roughly 7442.915 points all conspire to make this Brexit nonsense chaotic. The only thing we’re inclined to take seriously is our 7442 level, this important point in history delineated by BLUE on the chart below. Apparently, the FTSE faces a 300 point rise should the UK market ever stumble above such a point. It’s also worth pointing out the FTSE has experienced an 800 point rise so far this year, a 12.25 gain which is quite at odds with all the predictions of doom. If the market makes it above 7442, we anticipate a further 300 point gain for the market. Near term it’s a different story as there’s a risk of weakness establishing. Below 7367 looks capable of reversal to an initial 7340. If broken, our secondary calculates down at 7313 points. Neither reversal ambition presents a real worry as the RED uptrend is presently at 7143 points. But to be honest, we’d have raised eyebrows should anything permit 7313 to break as it will tend suggest weakness becoming established. Surprisingly, if we ignore the BLUE trend line (presently 7442), the immediate calculation suggests above 7420 should generate lift to 7458 near term. If bettered, secondary is a rather more useful 7563. We have our doubts, especially as the market appears to be giving the BLUE downtrend a body swerve at present, signalling we’re not the only folk with coloured crayons! We remain suspicious the index will continue oscillate between RED and BLUE until such time someone raised a white flag and surrenders over the Brexit issue, finally allowing direction to make itself known. 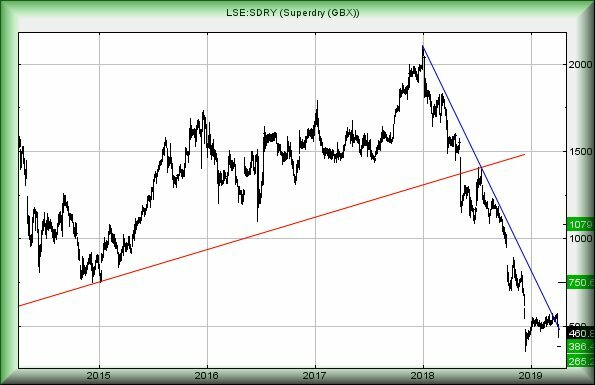 When a downtrend is as neatly defined as SDRY’s, a trend break which fails to perform flamboyantly is always a worry. 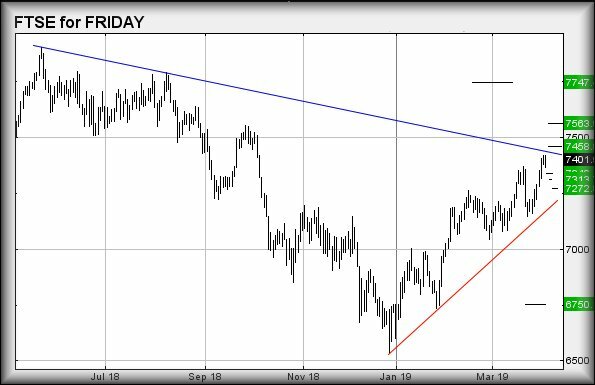 Worse, and perhaps more importantly, if the share price closes below the point of trend break, we’ve learned caution is often a worthwhile stance. SDRY broke the trend at 541p back on March 25th. It failed to gain any real upward momentum, instead closing the session of April 2nd at 500p. 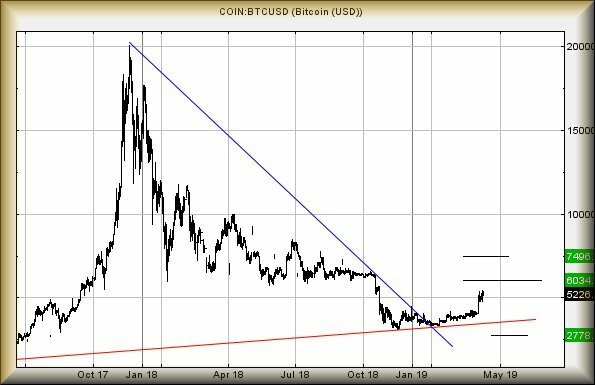 Despite the BLUE trend line being at 499.375 and thus, the share remaining in positive territory, it was now substantially below the point of trend break. As a result, we dared not trust it. Price moves on the 3rd April tended justify our caution and instead of an article devoted entirely to future positives, the share deserved something which reviewed both sides of the argument. Which is a pity, ‘cos seeing a BoD resign en-masse at the prospect of the company founder returning with the intention of saving the company was quite refreshing. The situation now is slightly alarming. Weakness continuing below 433 looks capable of reaching 386p, hopefully able to generate a bounce at such a level. If broken, we can calculate bottom at 265p eventually. 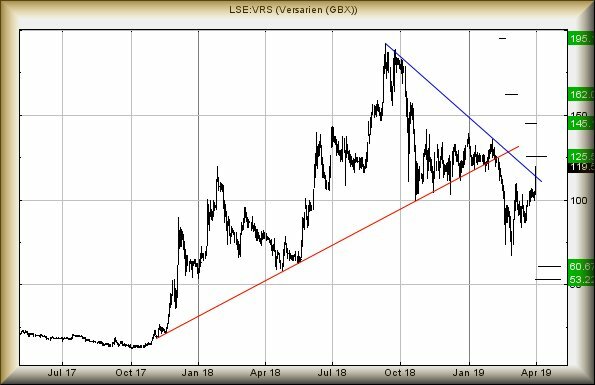 The share price needs a miracle above 576p before anyone dare relax for the longer term, this level apparently being a trigger for recovery to an initial 750p with secondary, if beaten, a longer term 1079p. For now, while a bounce at 386 looks pretty possible, we have a sneaking suspicion the price shall eventually bottom down at 265p. Perhaps it’s one worth keeping an eye on for the longer term. Fevertree #DAX #NASDAQ As it’s spring, Tuesday (in our bit of Scotland) started with a covering of snow, along with ice covered windscreens. Adding to the cheer was our little tractor, devoid of a big back wheel, awaiting work on its brakes. Some days, share prices inspire similar levels of enthusiasm for getting a job done…. 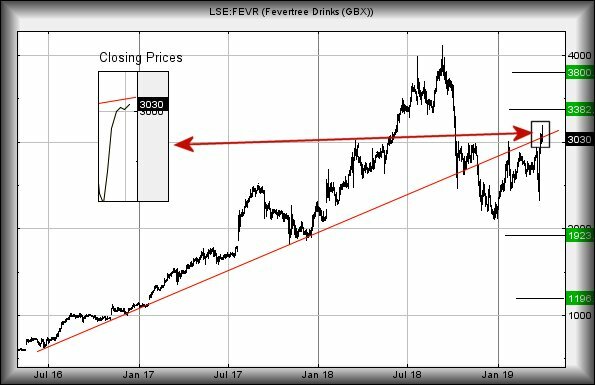 Thankfully, Fevertree does not join this grouping as the price looks capable of some continued movement upward as above 3190 now suggests coming recovery to an initial 3382. If exceeded, our longer term secondary calculates at a comfortable 3800. We’re mildly enthusiastic over this, if only due to the price ending its self imposed exile below 2950 and now closing solidly above its glass ceiling. The RED uptrend on the chart delineates closing prices since 2016. The inset on the chart illustrates how the price has closed during the most recent 4 sessions. Visually, the market is avoiding the share closing above the prior trend and this is always a worry. 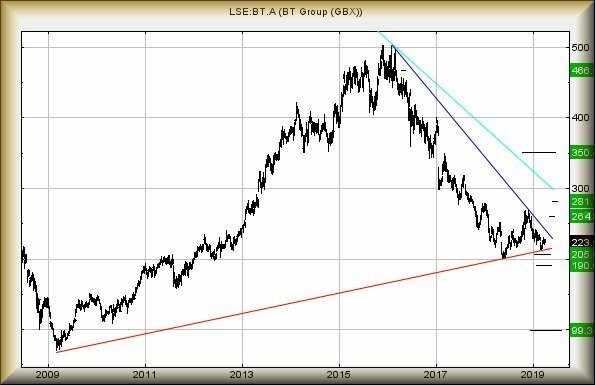 It appears growth cannot be safely assumed until the share price closes above the prior uptrend, presently at 3075p. The problem we have with these games is fairly simple. Until the price actually closes above this trend, it remains trading in a region where weakness below 2470 risks reversal to an initial 1923. If broken, secondary computes down at 1196p. 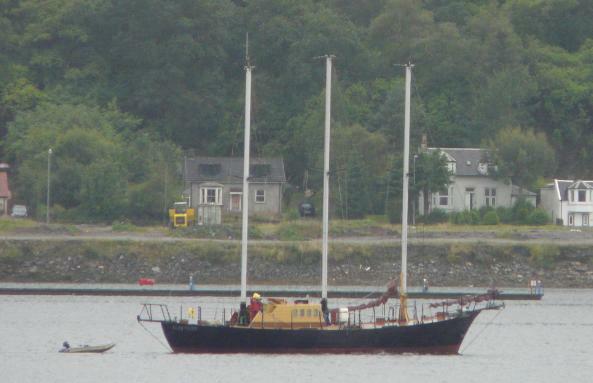 We suspect it intends head upward, perhaps just awaiting some sort of news report. 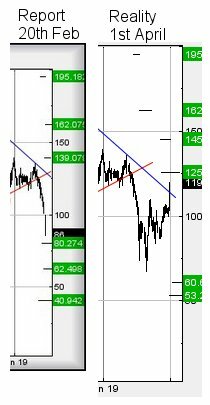 Versarien #Gold #SP500 April appears to have started with positive feeling across the market place. Of course, it could be an elaborate practical joke by politicians, designed to obscure the slightly important detail they are failing to govern the country. Are they really voting to decide whether to have a vote about a vote? The TV show, “Yes, Minister” seems now a work of documentary. When we last reviewed Versarien in February (link here), we’d speculated on the potential of them dropping to 62p. The intervening period highlights the share price “only” relaxed to 67p before exhibiting a reasonable bounce with the result, some optimism is possible for the future. The immediate situation appears quite straightforward. Price growth exceeding 120p should now make an attempt at an initial 125p. Visually, the price has form at this level, suggesting some sort of stumble awaits. Longer term, in the event it manages above 125p, we’re calculating a secondary at 145p, along with the potential for future game changing growth. We’re pretty comfortable proposing a glass ceiling awaits at 125p, if only due to the whole bunch of folks trapped at this level since October last year and exercising common sense to bail at break even. This, alone is pretty certain to cause a stutter. Of course, there is also the bunch of folk who can draw lines, assuming the price is about to hit this mythical thing called resistance. With closure above 125p, we’d take this as early warning for longer term growth above the 125p “glass ceiling”. The share needs wither below 100p to justify raised eyebrows, once again entering a weakness cycle with 60p calculating as the next target. If broken, it should bottom at 53p.